Montreal artist, Alexis Williams has a crush on mushrooms. She'll lead a free guided walk through a Montreal forest this weekend, part of SensoriuM's Taste Tour Series. While a pot of mushroom dye simmers nearby, this Concordia Art School graduate student tells me about the wonderful world of our fungal friends. Midnight Poutine: Alexis, it's clear from your site that you and mushrooms have a special relationship. How did this begin? Alexis Williams: I've always enjoyed mushrooms. For a little while when I was very young I refused to eat anything but raw button mushrooms. My Mum worried that they had no nutritional value and that I would waste away. MP: Oh dear! But...you didn't waste away, so that's good. Then what? AW: Nope, still here! In fact, it turns out that button mushrooms are rich in vitamins and minerals and are a source of dietary fiber, but our bodies have trouble breaking down the cell walls of uncooked mushrooms to get at the nutrients. Some wild mushrooms are toxic when raw, so cooking them is a good idea. MP: So, how did you learn about wild mushroom foraging? AW: A few decades after my raw mushroom infatuation I started noticing them in the forest so I bought a few field guides and stopped reading fiction altogether. There is something about them that I get fixated on. I started making spore print drawings. It's a technique usually used by scientists to help identify species but the spore prints, which can vary in color, are quite beautiful and mysterious. 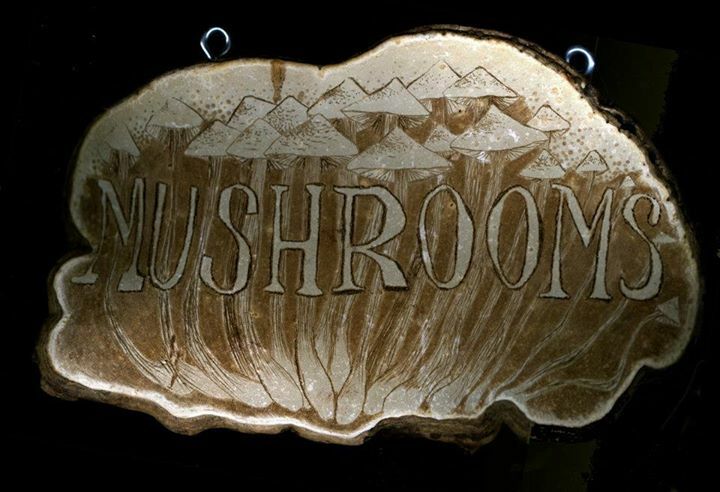 AW: I still print with mushroom spores on glass and fabric, and also grow edible and glow-in-the-dark mushrooms in a lab to use in living sculptural work. At the moment I am working on an installation where the viewer listens to a guided meditation on biology in a dark room. When their eyes adjust to the dark they realise...well, you'll have to come to the installation to see! The piece is part of a series of projects about the inaccuracies of our perception. MP: And, do you still like raw button mushrooms? In poutine? AW: Yes I still love raw buttons but I have lots of new favorites. Last week I cooked with honey mushrooms for the first time and they tasted great, somewhere between a Portobello and a Porcini. They are used as a thickener in sauces so I bet they would make a fantastic poutine, All squishy and gooey with fries and cheese. AW: And...the honey mushroom is the only edible glow in the dark mushroom I know of. It is also one of the largest and oldest living organisms on the planet at the moment. One specimen in Oregon is estimated to cover 2400 acres and be 9000 years old. MP: That's really incredible. Should we be afraid?! AW: Nope, and that's mostly because they aren't understood enough. Historically, there has not been as much study of the fungal kingdom as the plants and animals partly because they were thought to be related to the devil. Though, I believe there is a lot of unreasonable mycophobia in our culture. There is a certain massive fungus that is a parasite and kills forests, but most fungi are essential to forest growth and well-being. It's wise to avoid eating something that you don't completely know and since mushrooms are notoriously difficult to identify they do occasionally cause deadly poisonings.... On the other hand they have many positive applications. MP:And you'll tell us some when we walk in the arboretum this weekend! Can you write a haiku about what we might experience? MP: Any basics that attendees might like to know in advance? AW: There is much more to a mushroom than meets the eye--there's mycelium! Mycelium is to the mushroom as the tree is to the apple. A mushroom is the fruit of a larger less conspicuous organism, mycelium, that lives either inside living or dead wood, underground or in a living or dead critter of some sort. Mycelium is a very important decomposer of plant and animal material (it can even break down rock) and holds soil together. Many plants would not be able to get enough water or nutrients without the complex relationships with their fungal partners. MP: Awesome, I can't wait to learn and see more this weekend. By the way, what are you dyeing over there? AW: I have a pair of stripy tights in a dye pot on the stove right now. I'm using a bunch of dyer's polypore to get a better color than the inky caps I used earlier this week. MP: Can't wait to see them. Any last thoughts on mushrooms? AW: Paul Stamets says that we need to learn from mushrooms in order to survive. They feature in my work as a symbol of growth and decay and have helped me understand the connections between all living things. The most important thing I've learned from studying mushrooms is: "You cannot see without looking." MP: This makes it a great fit for the SensoriuM series then. See you Saturday! Join Alex for a Guided Mushroom Walk on Saturday, October 26 at 2 pm at Morgan Arboretum. The walk is free but entrance to the arboretum costs $6 for adults and $4 for students. Please RSVP to info@lesensorium.com to get directions and to find out what to bring. Carpooling may be available.